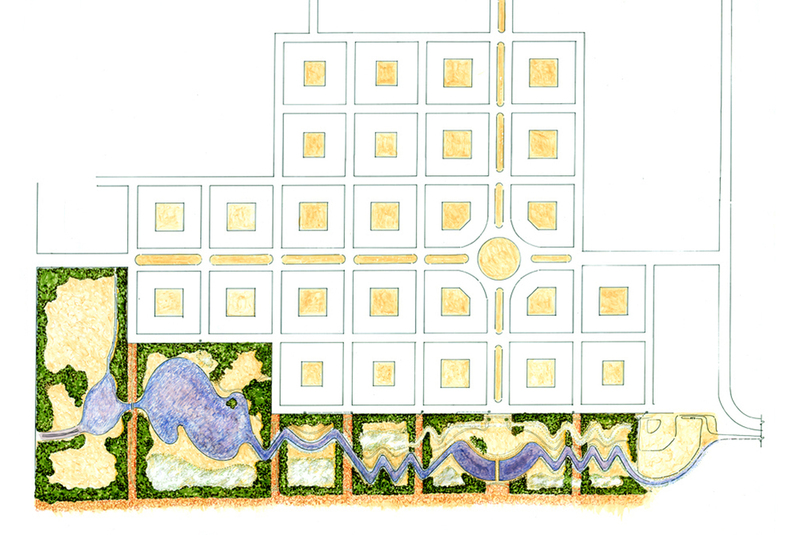 For a new development in the suburb of Minneapolis, we proposed a drainage system with a dual purpose: provide drainage for the development of nearly 500 homes and create and function as a public space. Dubbed ‘Park Place’ by local residents, the 91-acre park has now become an integral part of the community, not only as a part of infrastructure, but also as a public amenity. A series of strategies are used to temporarily store excess water and mitigate the risks of flooding through a swale system, ponds and channels planted with grasses and sedges. It resolves environmentally the issue of frequent flooding in a flat plain-with a high water table and peak storm volumes-emptying in the Red River. 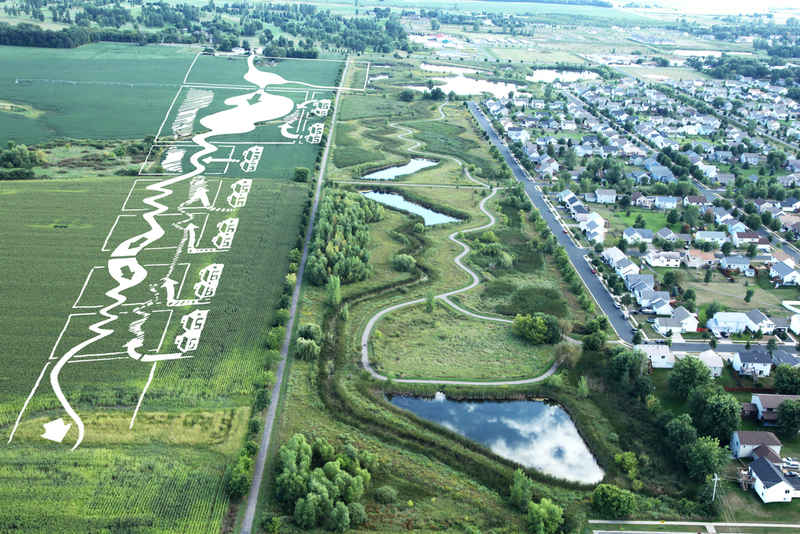 The designed riparian system consists of a civic lawn on axis with the downtown area, flanked by playing fields, bike paths and pedestrian paths; glimpses of wildlife are provided by the wetlands associated with this urban waterway. CLIENT Institute for Advanced Study / SIZE 15,000 Sq ft. / STATUS Completed 1996 / DESIGN TEAM Balmori Associates, Inc. / Van Zelm, Spiegel & Zamecnik, Inc. / Geotech; Melick-Tully & Associates , Inc.
A spare quadrangle enclosed by cherry trees sits at the campus’ eastern edge; a vista towards the woods stretches out on one side of a vast open lawn. A traditional slate blackboard, a surface from within the buildings, is now a built outdoor element, to be written on and erased by the mathematicians passing through the courtyard. 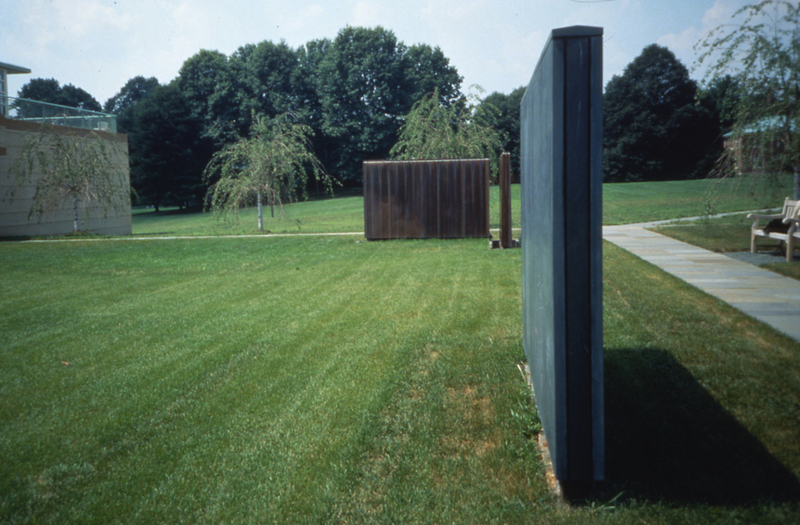 Several feet away, two copper-clad slabs sit perpendicular to each other, forming a corner. Water streams continually down their surfaces and leaves a lasting mark visible in the winter when the water is turned off. These minimal components, with changing markings, are a modern reworking of the traditional elements of fountain and wall. 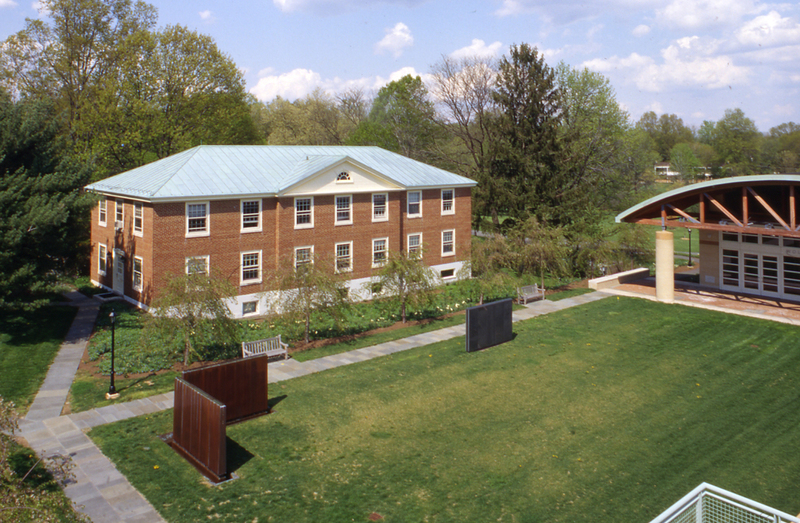 The courtyard is organized to provide access to the two buildings while maintaining an expansive central area where outdoor recitals may be held or individuals can sit under the cherry trees that define the edges of the courtyard.